Cobalt Group (aka TEMP.Metastrike), active since at least late 2016, have been suspected in attacks across dozens of countries. The group primarily targets financial organizations, often with the use of ATM malware. Researchers also believe they are responsible for a series of attacks on the SWIFT banking system which costs millions in damages to the impacted entities. On August 13, ASERT observed the financially-motivated hacking group actively pushing a new campaign. We believe the targeted institutions for the ongoing campaign are located in eastern Europe and Russia. The active campaigns utilize spear phishing messages to gain entry. The emails appear to come from a financial vendor or partner, increasing the likelihood of infection. The group uses tools that can bypass Window’s defenses. NOTE: Arbor APS enterprise security products detect and block all activity noted in this report. Recent campaigns masquerade as other financial institutions or a financial supplier/partner domain to trick potential victims into trusting the messages. One phishing email contains two malicious URLs. The first one is a weaponized Word document. 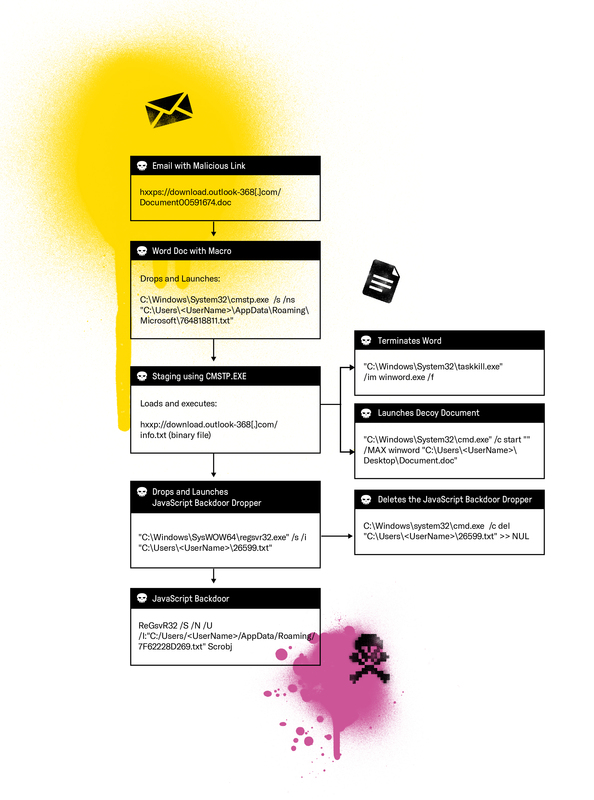 The document contains obfuscated VBA scripts as opposed to known CVEs used in parallel to this campaign. The second one is a binary with a jpg extension. The binaries analyzed contained two unique C2 servers we believe are owned and operated by the Cobalt hacking Group. An AppLocker by-pass technique (squiblydoo). Security Researchers identify a “patient zero” binary and called it CobInt. An found a sample on July 9, 2018 and called it COOLPANTS. The sample evolution supports the theory that rietumu[. ]me belongs to the Cobalt hacking group. After inspecting the domain, rietumu[. ]me, ASERT uncovered the email address solisariana[@]protonmail[.]com. Pivoting on the email leads to five additional domains each with a creation date of: 2018-08-01. Hunting for samples associated with inter-kassa[. ]com leads to a phishing email uploaded to VirusTotal, d3ac921038773c9b59fa6b229baa6469 (Figure 2). At the time of analysis, VirusTotal scored the phishing email with a 0, indicating nothing malicious was identified by the anti-virus engines. Not live at time of analysis but a sample matching the full URL was uploaded to VirusTotal. The document from the embedded URL in the phishing email, Document00591674.doc (61e3207a3ea674c2ae012f44f2f5618b), renders a VBA infested word document which continues the infection cycle once macros are enabled. NOTE: The document requires user permission and/or a policy enabled that allows Macros to run for a successful launch. The VBA script pieces together a cmd.exe command that launches cmstp.exe with an INF file (figure 3) allowing to potentially by-pass AppLocker. The INF file then beacons to download.outlook-368[. ]com to download a remote payload that cmstp.exe will execute. The DLL file, 31385.txt, masquerading as a text file, is the last stage in the infection chain. The DLL drops the final obfuscated embedded file and launches it using regsvr32.exe before deleting itself (Figure 6). d&exec – Downloads and executes a PE file. more_eggs – Downloads an update for itself. gtfo – Delete itself and related registry entries. more_onion – Executes the “new” copy of itself. vai_x – Executes a command via cmd. NOTE: Commands 1 – 4 match the commands described in other public reporting. Command 5 differs in name only; what it does remains the same. The public report shows “more_power” as the name of the fifth command. The second URL identified in the phishing email, hxxp://sepa-europa[. ]eu/transactions/id02082018.jpg, acts as a red-herring; id02082018.jpg, 9a87da405a53eaf32f8a24d3abb085af - UPX unpacked, is an executable rather than an image file. The sample is littered with junk code that spends CPU cycles before proceeding to de-obfuscate itself. The unpacking routine involves overwriting itself in memory with another executable. This overwritten binary loads a resource and jumps to the executable code contained in it. The unpacked binary will fail when LoadResource is called if it’s not running in the context of the original binary (Figure 9). At the time of analysis, the C2 server did not respond; however, there is another binary with the same C2 found in ASERT’s malware zoo which bears a striking resemblance to CobInt. The binary, 452903fc857fb98f4339d7ce1884099, makes use of the C2 ibfseed[.]com. Comparing this binary to another CobInt (616199072a11d95373b3c38626ad4c93) sample using Diaphora, ASERT determined this to be another CobInt/COOLPANTS sample. We believe this binary is tied to Cobalt Group using the same methodology and binary comparisons as the previously discussed malware samples. 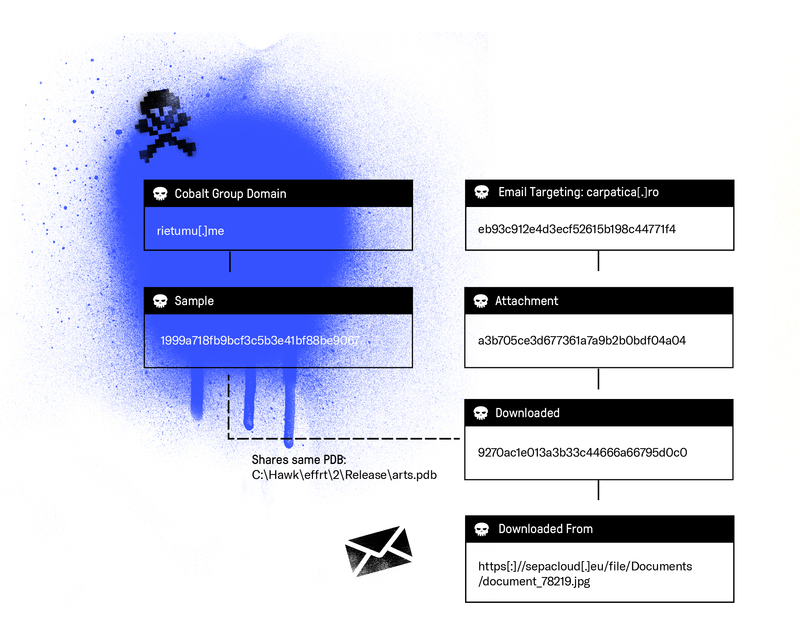 Working closely with Intel471, one of our Threat Intelligence partners, we found an additional Cobalt Group phishing campaign targeting carpatica[. ]ro by masquerading as Single Euro Payments Area (SEPA). “carpatica[. ]ro” belongs to Banca Comercială Carpatica, a bank in Romania that merged with Patria Bank in 2017. The phishing email uncovered by Intel471 downloads 9270ac1e013a3b33c44666a66795d0c0. The downloaded file shares the same PDB string as 1999a718fb9bcf3c5b3e41bf88be9067. That sample connects to rietumu[. ]me, which ASERT identified as belonging to Cobalt Group (Figure 12). This Cobalt Group actor(s) mimic financial entities or their vendors/partners in order to gain a foothold in the target’s network. Making use of separate infection points in one email with two separate C2s makes this email peculiar. One could speculate that this would increase the infection odds. The actor tries to hide the infection by using regsvr32.exe and cmstp.exe, which are both known for by-passing AppLocker (configuration dependent). ASERT believes Cobalt Group will continue targeting financial organizations in Eastern Europe and Russia based on the observables in this campaign and their normal modus operandi. ASERT also recommends that employees are trained to spot phishing emails and, where possible, closely inspect emails for look-alike domains that might contain malicious attachments or links.